No “regular” DD this month, but at least there’s Daredevil Noir, and that’s not a bad consolation price. While this issue failed to completely floor me the way the first issue did a month ago, this continues to be very high quality writing mixed with incredible art. The pace feels just a little bit slower due to this being more of a middle of the arc issue. Introductions are over, and chess pieces are starting to move around the board as the plot advances. One thing I sort of skimmed over in my last review, but which continues to impress the heck out of me is Irvine’s knack for what I generally just label “senses writing.” The writers who’ve worked on this character throughout his history vary in how much they will reference his unique perspective, and those who try to include it vary in just how well they do it. There’s a thin line between poetic and insightful, and pretentious. Irvine does it so well, that it’s almost like you can taste the filth and gunpowder in the air. Of course, Tomm Coker’s art doesn’t hurt. When Daredevil descends on a crime scene and the bullets start flying, he thinks to himself: “But gunfire is all around me, every ricochet like a needle in my brain … it’s about control. I can dodge a bullet. I can’t dodge the sound.” That single statement says a lot about the character and how he operates. In this issue, Daredevil gets his first “look” at the work of the Bulls Eye Killer, a mysterious assassin working for Halloran, the new gangster going after the Kingpin’s turf, and he also learns about Halloran’s connections to his own past. Matt’s relationship with Foggy gets a little more depth and we also have a scene between Matt and the mysterious Eliza,* whom Matt is clearly getting attached to. She has revealed something of great importance to Foggy, and does the same to Matt when she meets him, but all the details are kept hidden from the reader, forcing us to keep guessing. There are also great connecting opening and closing scenes with the Kingpin who is written as every bit the great manipulator he should be. 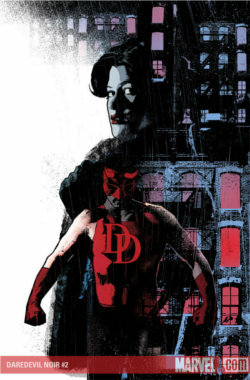 This is a great issue, and I recommend this mini series to everyone who likes the character because whether you consider a noir take on Daredevil to be superfluous or not, this is a great story. Go pick this up if you haven’t already.